Fresh herbs are my passion! 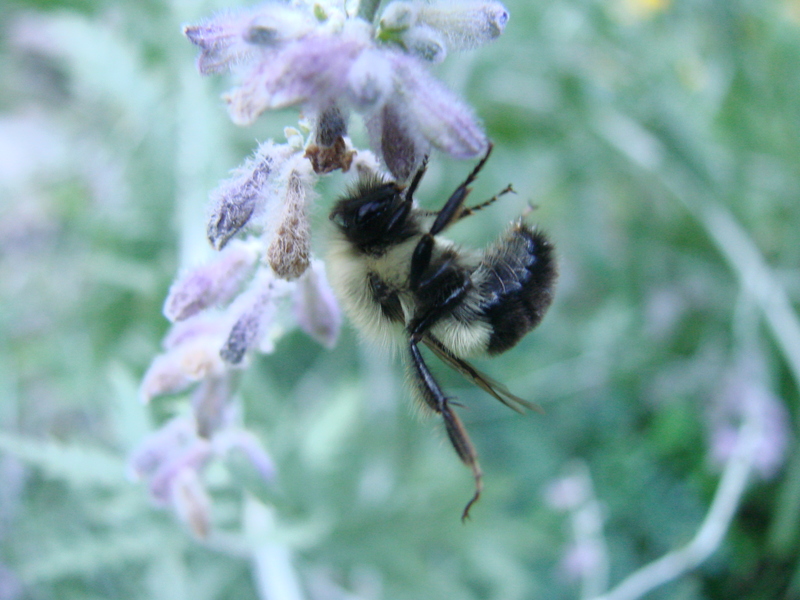 Russian Sage......Bees love these lovely blossoms! There is nothing more enjoyable than to walk through my herb garden in the early hours on a dewy morning. As I walk down the path the fragrances all mix and change with every step I take. I feel as if I am in a cloud of aromas, which enhance my imagination and bring about pictures of culinary experiences, which I have stored in my subconscious. My interest in herbs has intensified these past few years. They add not only fragrance and flavor to the meals, but their fresh colors are always a pleasure on everyone’s plate. And growing them in my own garden is an exhilarating experience. I love to see them coming back every spring and watch them growing into huge bushes with their burst of flowers in the summer. When I cook I love to be able to step out of my kitchen and pick the herbs, as I need them for whatever recipe I am preparing. 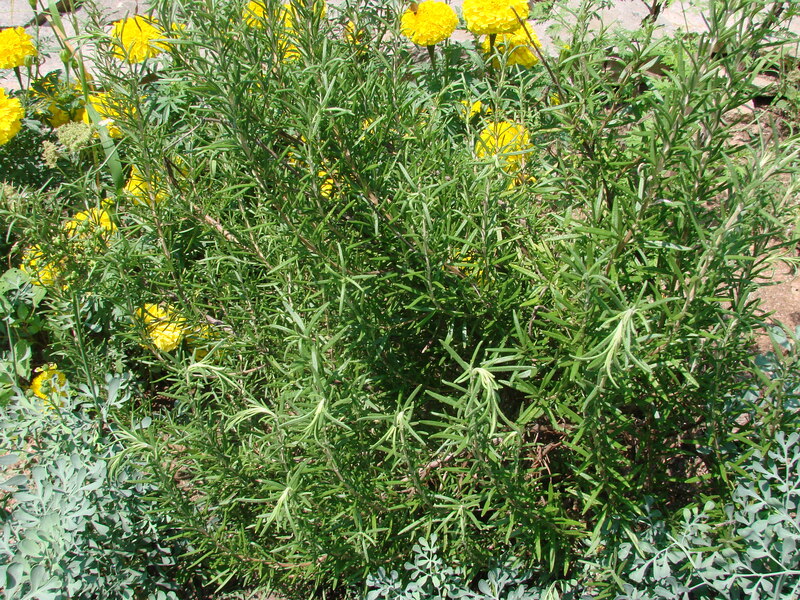 Herbs are essentially wild plants or weeds and are therefore easy to grow. Some will never leave your garden once you have allowed them to take root in it. One of these herbs is mint. 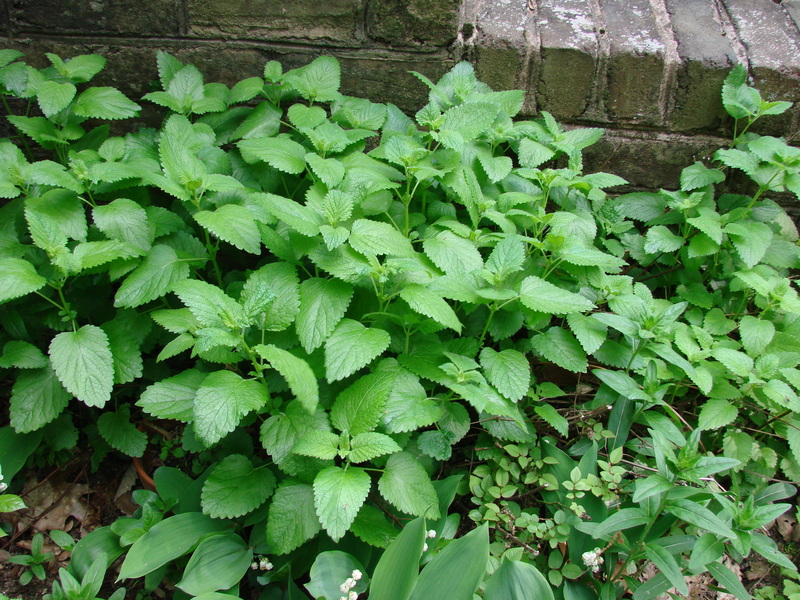 If you do not wish Mint to permanently settle in your garden then you need to grow it in a pot. 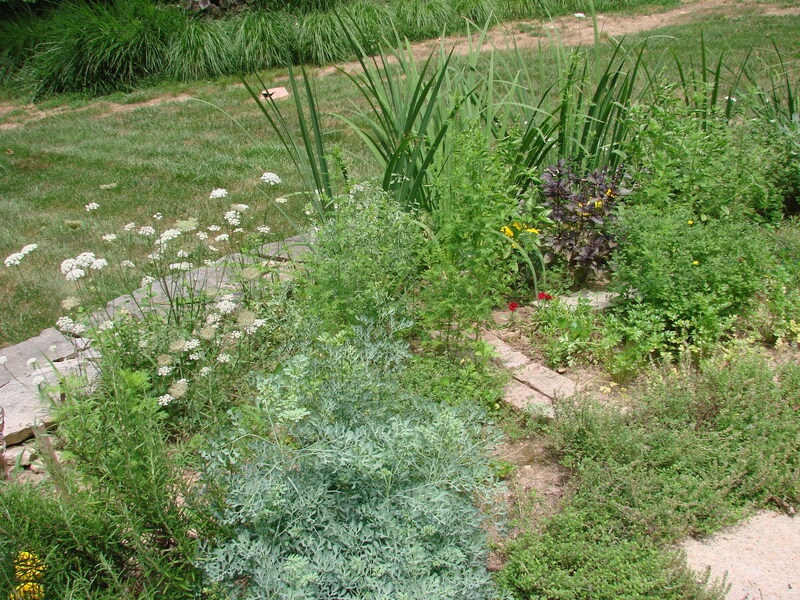 Some of the herbs which I have in my garden are: oregano, thyme, tarragon, basil, lavender, mint, lemon balm, marjoram, chives, parsley, rosemary, tansy, savory, sage, cilantro and woodruff. I have had difficulty growing dill, which is actually one of my favorite herbs. I have tried to grow some of the edible flowers, like nasturtiums, marigolds, violets, pansies, calendulas and roses. But with the proliferation of the deer in our area, it is difficult to nurture them. These beautiful flowers become breakfast in the morning and dinner in the evening for them. Other aspects of herbs are the myths and wisdom that have been with us throughout the centuries. DILL – An astrological herbalists of the 17th century claimed that dill was ruled by the planet Mercury, imparting strong intellectual powers to anyone who consumed it. 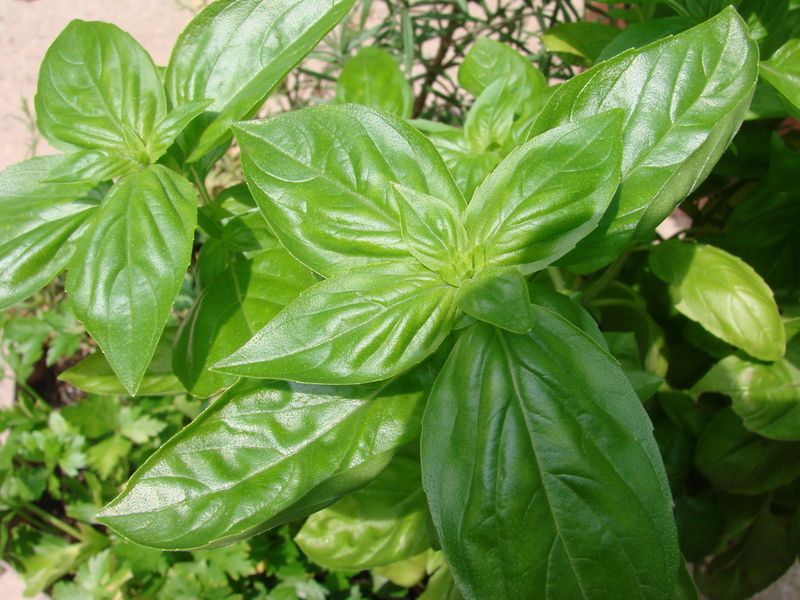 In one of the tales of the 17th century, a man in Sienna, Italy, who used dried basil as snuff subsequently went insane and died. Rosemary - is for Remembrance! It was said that the herb refused to grow in the gardens of evil people. Even the blossoms are edible! During Marco Polo’s time herbalists claimed that eating raw chives would cause “evil vapors” in the brain. Mint will be in your garden for ever! In Greece, the myth is about Minte, a nymph who was pursued by Pluto, whose jealous wife turned her into a low-growing plant. The mint, although trodden underfoot, smelled sweet. Putting these myths about the herbs aside, we take great pleasure in tasting them in our prepared foods of today. I am sure all of you have many delicious dishes that you prepare often, and hardly think of the herbs you put into them, just to enhance your eating pleasure. that I taught,in my cooking classes. Place one Won Ton Skin on a board. Place a fresh Basil leafs on top. Place another Won Ton Skin on top of Basil leave. Roll this “sandwich” with a rolling pin till they stick together. The leave will be translucent in the dough. Make twelve of these special Won Ton Skins. Mix all ingredients and chill in refrigerator for about 12 hour. Use the prepared won ton skins to make ravioli. Place one skin onto a board. Put 1 Tbsp of salmon mixture onto the won ton skin. Brush won ton edges with water and place the Basil leaf won ton on top. Press down on the edges to seal. Cook ravioli in salted boiling water, for about 10-15 minutes. Keep the cooked ravioli in a Pyrex baking pan – covered in a warm oven. Ravioli can be made ahead and warmed up quickly in hot water before serving with the Pesto Sauce. Mix all ingredients in a saucepan and bring to a boil until it thickens…and adjust flavor with lemon juice. 1/3 cup pine nuts or walnuts (if used for sauce omit nuts and substitute with 1/3 cup bread crumbs. Bread crumbs will thicken your sauce. Place all ingredients into a blender and process until it becomes a paste (pesto). This recipe can be doubled, tripled, etc. It keeps in the refrigerator for 1 week or freeze it for 6 months. Mix all ingredients in a saucepan and bring to a boil – quickly remove from heat. Mix lemon juice into the sauce – it will thicken when juice is added. Adjust flavor with salt and white pepper. 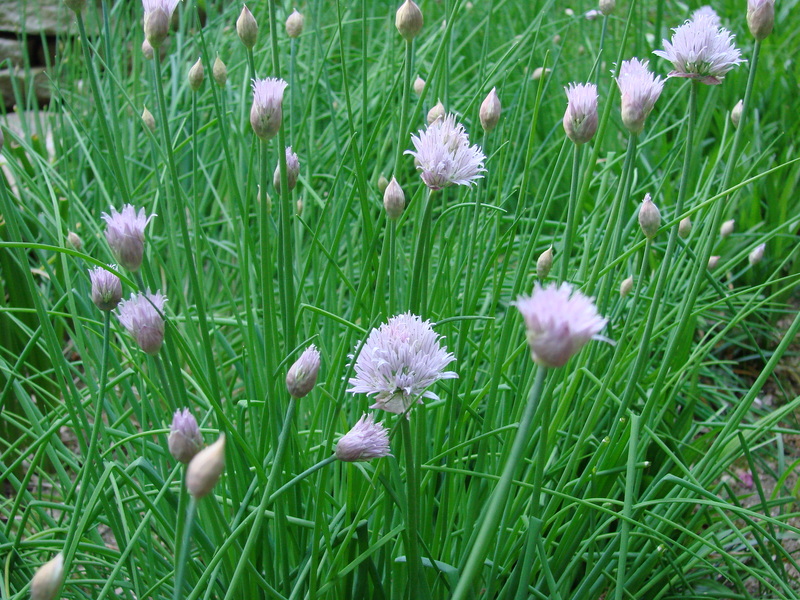 Garnish plate with chives – if chives are in bloom – use the little pom-pom blossoms as well. 1 pkg Knox Gelatin – bloomed with 2 Tbsp water – dissolved in microwave. Or: instead of the Gelatin – use 2 packages of “Whip-It” by Oetker. This cream stabilizer is available in grocery stores in the baking section. Note: Gelatin sometimes gives you lumps in your cream – it congeals too quickly due to the cold cream. Therefore, I prefer to use “Whip-It”. Bloom gelatin and microwave 3 times at 10 seconds each time to dissolve. Whip cream with sugar until soft peaks form, add gelatin slowly while mixing the cream. Add liqueurs into the cream using the same method. Optional: Chop fresh mint and mix into the mousse, and spoon into an attractive glass. Refrigerate before serving. Serve with a rosette of whipped cream and a mint sprig. What a pretty herb garden–I’m envious. Interesting–I’ve been using a lot of fresh herbs, too, this year. What a pleasure it will be to see your recipes here. I will come back often. p.s. Kaffeehaus just went out of print, but I am working on getting it back as an ebook, or maybe a paperback.